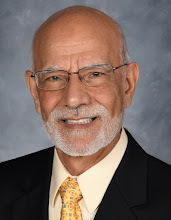 Dr. Mehdi Alavi: O God ! Life is filled with challenges. What do we do when we cannot take it anymore? How do we solve our problems? Should we worry about thinking and looking differently? Find the answers to these questions and more. 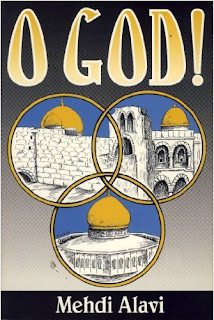 O God!, written in fiction, inspires morals which enable us to blossom as a leaders with self-assurance and true love for others. A book for theologians and layperson, men and women, all races, and folks from all walks of life. O God! is a story of a secretary in a Jewish law firm in Oklahoma City, USA, around the First Gulf War in 1990. Irene, a young married mother finds herself overwhelmed, overworked, unappreciated, oppressed at work and on the home front. Despite living in survival mode herself, she attempts in her meek and altruistic manner to save Mo, a Muslim lawyer in the firm. She finds herself in awe of his self-confidence, intelligence, politeness, and respect for others. In discussion with the firm’s Christian, Jewish, and Muslim lawyers, she overcomes her prejudices and discovers her true self. She develops self-confidence, enriches her Christian faith, and blossoms as a leader with true love for others. The dialogue reveals real life characters and builds on what we all have in common. It deals with the role of reasoning in daily life and current issues of personal, national and international significance. O God! is a powerful tool to harvest our inner treasure, empowering us to live to our fullest potential. It emphasizes the importance of our inter-relationship. It gives a perspective of people coming from different cultures and backgrounds and despite of the stereotypes we have for different religions and cultures. There is a significant areas where all people share common core values and principles. 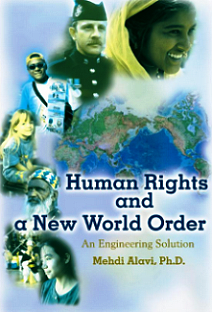 Human Rights and a New World Order: An Engineering Solution by Dr. Mehdi Alavi reveals that the United Nations, Amnesty International, World Watch and other human rights organizations have made little progress in the resolution of true world peace and human rights. In this thought-provoking book, Dr. Alavi has proposed a remarkable formula that could be implemented under the existing United Nations Charter which would significantly help with efforts made in human rights and world peace. O God! is a story of an unappreciated and overworked wife and mother who works as a secretary in a law firm in Oklahoma City, USA, around the First Gulf War in 1990. In discussion with the firm’s Christian, Jewish, and Muslim lawyers, she overcomes her prejudices through reasoning, develops confidence, and learns to truly love others. O God! by Dr. Mehdi Alavi, written in fiction, inspires morals which enable one to blossom as a leader with self-assurance and true love for others. A book for men and women, all races, and folks from all walks of life.